Let's face it... all the cool receiver stations have owls. And, not to be outdone by the owls at the LOFAR site at Chilbolton, UK, KAIRA is proud to announce that we have a family of owls too. 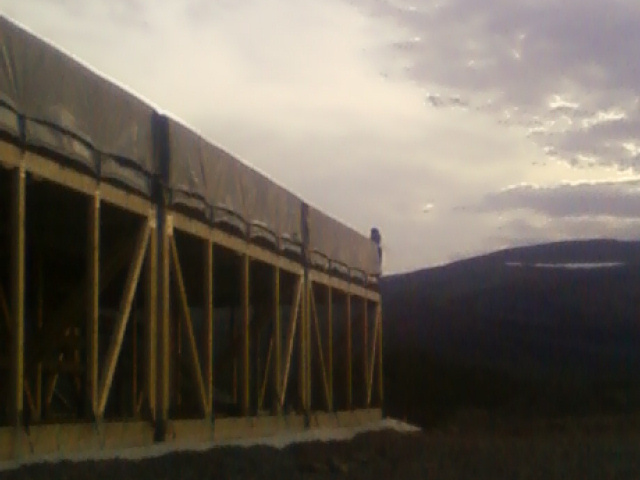 Three of us were working out at the site at around midnight when we spotted a grey shape swooping through the array. At first we saw only the one, but then it became apparent that there were three owls too... and one seemed a little unsteady; an owlet perhaps? We watched fascinated for a while as then moved about before flying on. It was quite dark (we're in that deep twilight phase at midnight now) and they were not too close. The photograph was the best I could manage in time (by the time I'd zoomed it, it had flown to a new position). The owl is perched right on the north corner of the tile. At this stage we're not completely certain what type of owl it is. Hopefully our wildlife expert will be able to solve the mystery. No doubt there will be more on this story when we tell him about it in the morning. Stay tuned!